Using the same style of holder which is predominant from ScaffTag, only much smaller, the ScaffTag micro tag is ideal for Scaffold safety harness, lanyards or anything which needs a periodic inspection and then recorded. Helps you to comply with legislation and good practice. 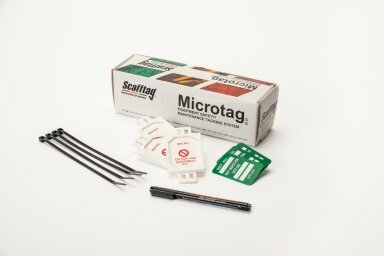 Supplied in boxes of 20 holders, 20 inserts, a pen and cable ties.